Electric currents passed through the brains of cocaine-addicted mice changes their behavior and can reduce their dependency on the drug, a new report found. As part of a new study, Swiss neuroscientists ran four experiments using deep brain stimulation (DBS) and a drug that blocks receptors for dopamine, a chemical messenger linked to addiction. Each experiment involved 60-80 mice, some of which were injected with cocaine – a drug that causes hyperactivity in the animal. 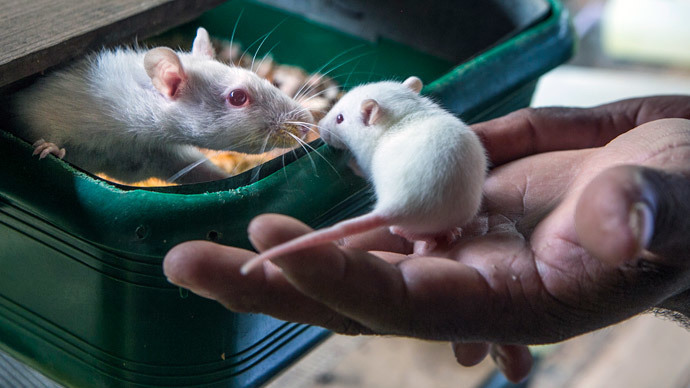 Since the mice became hyperactive after the cocaine was administered, scientists jolted the mice with two different frequencies to determine how they reacted as they withdrew from the drug, according to The Verge. To do this, electrodes were implanted in certain spots in the brain and stimulated using a pacemaker-like device that was then implanted under the skin. High-frequency DBS (130 Hz) were used to stimulate the mice, which provided the rodents with short-lived relief from hyperactivity. However, low-frequency DBS (12 Hz) – when used with a dopamine receptor-blocking synthetic compound – actually helped the mice behave normally. Previous studies looked into using DBS to cure addition, but it’s still unclear which parts of the brain researchers should target with electric stimulation. It has already been used in humans for treating symptoms of Parkinson’s, but shocking the right areas – as well as using the right “dosage” of electricity – is crucial. Electroconvulsive Therapy (ECT) has been used since the 1940s and 1950s, but because of unfavorable news reports and media coverage surrounding many potential negative side-effects – such as cognitive and memory dysfunction – it has a controversial history. Michael Stefanik, a postdoctoral research associate at Rosalind Franklin University, said the mice findings were “promising,” adding that more work is needed to determine whether it could be applied to humans. Of course, mice brains are much less complicated than human brains, but even if it proves effective, Christian Luesche, a neuroscience professor and one of the researchers, said the method won’t be widely used.